I knew that Ellen was sending me something. She'd FB messaged me and asked for my address and written about it on her blog, too, I think. All I knew was that it was something she got at an estate sale and I was excited because, well, everyone likes to get something in the mail, right? She said that it was something that when she'd seen it, she knew it belonged to me. These things can be tricky. People can give you things believing with all of their hearts that it's something you will love. And sometimes you do! And sometimes...it's like...do you even know me? 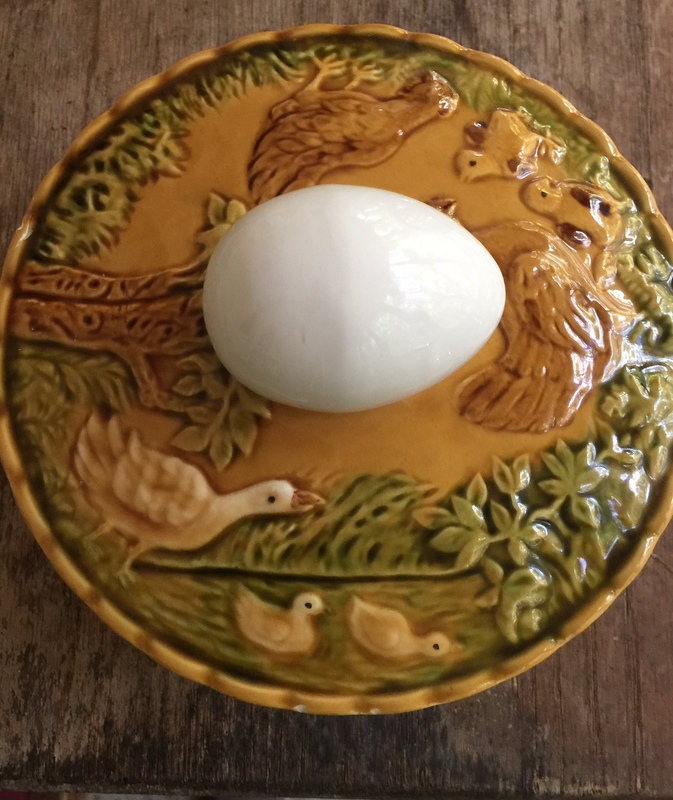 Look at that little lidded bowl with a beautiful egg for a handle! It is absolutely perfectly perfect and the way those hens and chicks and duck and ducklings are portrayed are absolutely adorable and precious. See the one hen talking to her baby with the baby paying such close attention? Or is she feeding her a juicy bug? And the other hen with her beak in the grass, finding something delicious to eat? The artist certainly had been paying attention. People love chickens and ducks. They are just such merry creatures and persistent and hard-working and chatty and friendly and they give us such perfect protein. Remember when I had Lily and Willy, the two ducks? How they'd talk to each other all day long? Such chatty conversations they had, such long narrations of what they were seeing and doing. Remember how they'd make lesbian love together? I'll never forget the time that Kathleen's husband came over after she'd died and he'd given us the two birds and they heard his voice in the yard and came running over to stand in front of his feet and looked up at him and then began to excitedly talk. I KNOW they were discussing him because they'd recognized him. I'd get more but their poop is just offensive. But if I had a pond, I'd have ducks. They have terrific personalities, as do chickens, but different. I have noticed today that when Little Richard runs, he actually gallops. Tarumph, tarumph, tarumph he goes across the yard to score his latest love. It seems to me that the roosters have all worked things out except for Dearie who mostly only shows up at sunset when he flies into the tree to roost with some of the hens. Anyway, I am so grateful to Ellen for seeing that dish and knowing I'd love it and packing it up so well and so tenderly and sending it from Texas to Florida for me. Send her good thoughts- they are in the path of Hurricane Harvey and that sucker is huge. It's been a good day. A quiet day. I walked, I hung laundry, I ironed, I took a nap. I have been thinking about what I'll make for supper on Sunday just in case Jessie and Vergil and August come through in time to eat on their way back from Asheville. It is truly starting to feel real that they will be here in just two days. The air tonight is heavy with the heat and the humidity too. It weighs down upon us with its own gravity. It is the kind of weather which leaves dogs panting in the cool dirt under porches. Thunder boomed a little while ago but I don't think we're going to get rain. It is almost time for a martini with a pickled okra in it. Mr. Moon is shelling a few late-season peas. The air conditioner rattles and runs and runs and rattles and I just pray that it continues to make its annoying song. 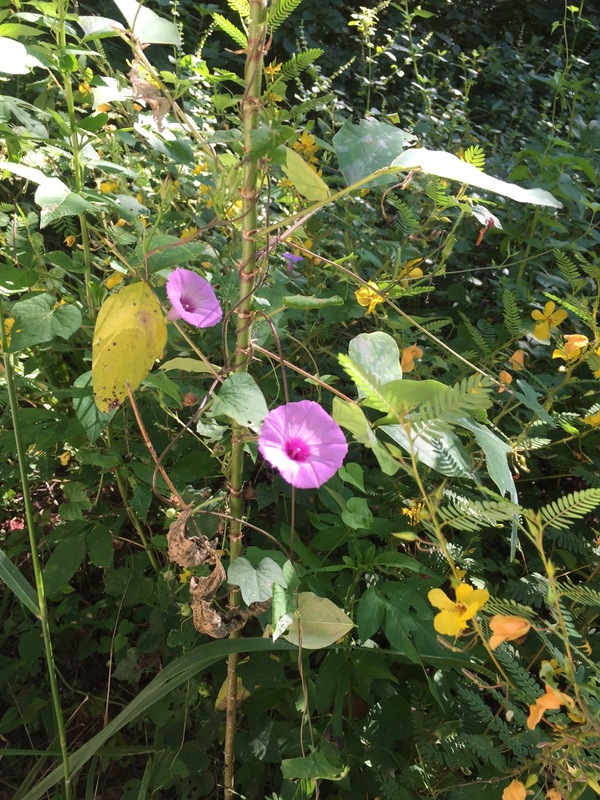 Tonight I am grateful for so much, even with the heat and suddenly, I remember that I took a picture on my walk this morning of the late summer bloomings. 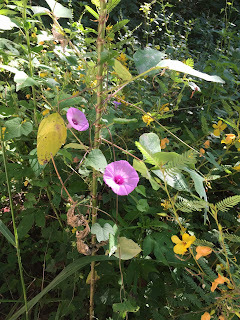 And there is one bend in the trail where the sulphur butterflies and the zebra-wings and the Gulf fritillaries dip and dart and pause and sip and lift and float and I know that there are good things about this dog-pant heat. There are things which make it bearable. There are gifts given by both nature and by friends which lift the heart. And I am not unaware of any of it. The egg bowl is perfection! Delightful bowl. At first I was wondering how you got that egg to balance on top until I read further to see you said it was the handle. It does look just like a real egg. This to me is a classic Ms Moon post. Just reading it calms my heart. I hope you blog forever! If you can get past the heat, late summer is a great time of year here. By the way, I missed the boat on your okra posts, but I believe that is the only crop I stopped growing because it gave me more than I could use and give away. Well, Jon, that may be the first time I've ever heard of anyone ceasing to grow a crop because it was too prolific! But I understand. I agree with Jill. That bowl is SO you! Darling. My mother lived in India for much of her young years and made a kind of curry with okra. But the curry was made of tomato sauce, various spices and potatoes. "Real" curry is not made with milk. Anyway, I liked it. I don't remember the okra being slimey. August is coming home!!!!!!! Yes. At the Indian restaurant where we love to eat, okra is often involved and is always delicious. Yessssssss to your visitors. Love the hard-boiled handle on the new bowl. Can you imagine making such a beautiful thing from a slab of clay? And then to glaze it just perfectly? Sheesh. Also, I thirds Jill's sentiments as well! I absolutely cannot imagine being able to create something like that. I don't have a damn bone in my body which is able to draw or shape like that. I am so glad you are writing again, Alex. So glad. I am so happy it arrived and you love it as much as I imagined. And I do love it. Just love it to pieces. It's so cheerful. 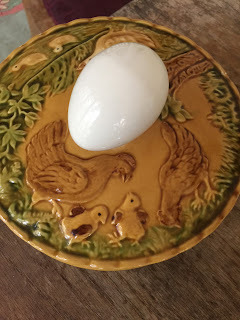 Only someone who loves you could have chosen that lidded egg bowl for you. I feel very, very lucky and loved and gifted. That is a FANTASTIC bowl!